MANILA, Philippines - ABS-CBN, the country’s leading media and entertainment company, goes the extra mile once again in providing news and public service to the Filipino people with a new and improved app for the national election on Monday, May 9. Filipinos can turn to the COMELEC Halalan App – a project of ABS-CBN and the Commission on Elections (COMELEC) – to check their status as voters, locate their precincts, check national candidates’ profiles, decide on their final bets through a ballot cheat sheet, get updated on election-related news and results, and also directly report election violations to the COMELEC. The News section provides users the latest election-related news from ABS-CBN News, the largest news organization in the Philippines, which operates in different media platforms. With the COMELEC Halalan 2016 app, voters are keep informed on the election issues wherever they are by just using their smartphones and gadgets. The Candidates page, meanwhile, gives users basic information on the candidates for president, vice president, senator, and even a list of all party-list groups participating in the national elections. Users may also press the check button beside their preferred candidates’ names, which will automatically be reflected on the My Ballot page, which may serve as a voter’s personal short list of preferred candidates. For those who need to know their voter status or are looking for their voting precinct, the My Status section will be able to help them as it presents the complete registration data of the voter with the user just providing basic information such as First Name, Middle Name, Last Name, and birthday. The Results page shows the status of election-related reports or complaints sent by the user through BMPM, which is also integrated in the app. Finally, there is the Halalan 101 section that features infographics, quotes, and facts about the elections developed by ABS-CBN News Digital. First launched in 2012, the newest version of the COMELEC Halalan App was reintroduced by ABS-CBN in 2015 with new features that empower them to make a difference in this year’s polls. First, the app can now update users on the status of their election violation reports sent through the app. Both ABS-CBN News and COMELEC have put up their respective command centers to immediately respond to voter queries and complaints. For its part, ABS-CBN News is tapping its citizen journalism arm, Bayan Mo iPatrol Mo (BMPM), which has had extensive experience handling citizen queries and complaints in the past elections. Users only have to create an account and register to use the app to report election violations. The new version also includes election data and facts and figures that may be shared on social media to spread awareness on election issues and help voters make informed decisions when they cast their ballots on election day. Arlene Burgos, ABS-CBN News Digital Head for Social Media and Mobile, said the new COMELEC Halalan 2016 App is a big improvement from its earlier versions, and gives voters a unique experience that no other election app can provide. “We listened to the people and worked hand-in-hand with the COMELEC to come up with an app that can really be useful to voters. Thankfully, through everyone’s hard work, we’ve come up with an app that makes it easier for citizens to report or inquire, empowers the Comelec to act on these submissions by our citizens and Bayan Patrollers, and enhances ABS-CBN News’ efforts to educate the voting public,” Burgos said. 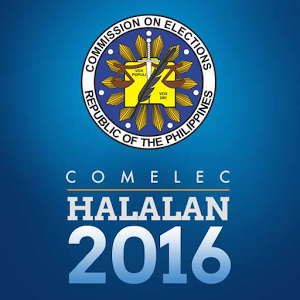 The COMELEC Halalan 2016 app is available on App Store and Google Play and can be downloaded for free. The COMELEC Halalan 2016 app is part of ABS-CBN’s “Ipanalo ang Pamilyang Pilipino” Halalan 2016 campaign that encourages the public to support candidates that will stand up for the needs and protect the Filipino family. The ABS-CBN Integrated News and Current Affairs’ extensive and comprehensive reportage of this election season is set to go full blast on Monday with a cross platform marathon news coverage of the national polls which starts early morning.